Collections business is surely risky, but it is also passionate and that’s the reason you like it. You do your job and you do it well. Your customers are happy and you are adding more accounts daily. Through years of experience, you have learned the value of each of your agent’s time and you understand how important it is to make the right customer call, at the right time, using the right phone number. You want a bigger chunk of the business, but growth is a challenging task. You need smart data import that would run automatically and clean up the data. You want skip tracing and bankruptcy scrubbing on imported accounts. You would like a system integrated directly with a print house for letter processing, a bank for ACH transactions and a processor for debit cards. And it would really be nice to have an automated credit bureau reporting and commissions disbursement. You need software that can automatically handle your routine and allow you do what you do best – collect money! UniPay might be exactly what you are looking for. Flexible data import engine, automated skip tracing and bankruptcy scrubbing, print house integration, as well as wide choice of banks and card platforms can surely simplify your day-to-day routine, while powerful remittance logic is very likely to reduce your monthly reconciliation todo list. We, as a team, will help you streamline your recurring data imports and ensure that all new accounts, regardless of the format and medium, make it successfully into the unified system. We can help you draft your collections letters and emails and ensure that they are sent on time. Finally, we will guide you through all applicable application’s features, ensuring that your business remains an overwhelming success. 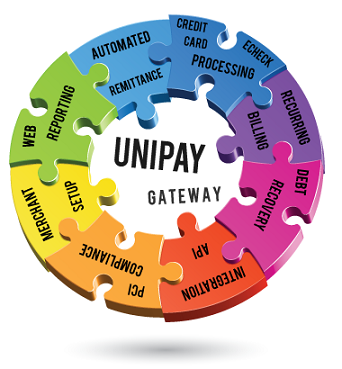 Contact us to discuss your options as UniPay powered Collections Company. Get to know more about a payment processing solution which will meet the requirements of a collections company.